There's no need to worry about unwanted changes occurring. 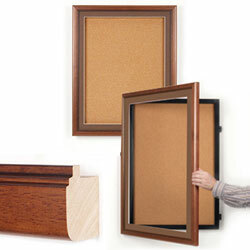 These cork boards will keep your displays secure. 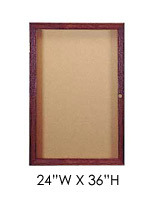 With its masked hinges and gravity-locking door, only you will know how the memo board works. Regardless of this, the cork boards couldn't be easier to use! 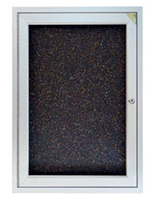 Merely slide your hand up the back of the frame to release the gravity lock and the frame will open a full 90º to reveal the 24" x 36" cork display location. With this much room, you can post and tack with comfort! As soon as you've completed making changes, merely hold up the gravity lock while closing the memo board's frame until it closes and the lock falls into place. 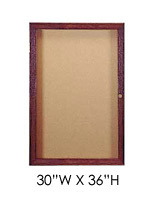 Once in place, your memo board is secure and secure. These cork boards also provide a protective window made of shatter-resistant acrylic. 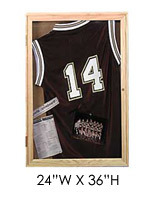 Its clear acrylic window maintains your critical display maintain and undisturbed yet fully seeable. Engineered to endure the abuse of such high-traffic location. as hotel lobbies, libraries and coffee shops, your displays aren't going anyplace. So leave your worries of meddling in the back of! Don't let your information displays go unnoticed! 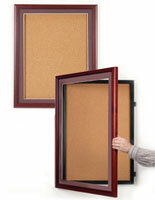 Capture their awareness and enclose your subject matter and memos in these wooden framed cork boards. These cork boards incorporate a traditional wood finish that is complemented by a coordinating colored mat board trim. 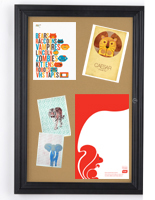 The beveled mat board, which stays attached to the inside of the frame, brings an supplemental dimension of pure elegance to the memo board's frame. Additionally to the warm Walnut finish you view here, we also extend these cork boards in 4 supplemental finishes to select from. By adding such cork cork boards as these enclosed bulletin boards to your office décor, your critical flyers and posters won't be overlooked any longer! 28.8" x 40.8" x 2.6"